a graduating senior who participated and excelled in the ROTC program at each participating high school in St George. Determined by the ROTC commanding leadership team, the chosen high school senior cadet is the cadet who greatly demonstrated qualities of dependability, good character, adherence to military discipline, is patriotic and possesses leadership ability. 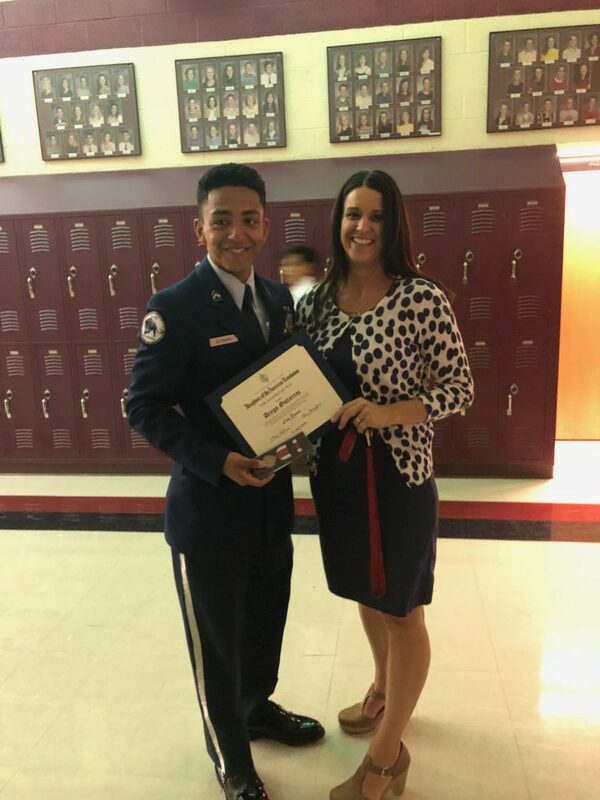 On April 27 Color Country Chapter member Julie Brown proudly presented this distinguished award to AFJROTC Cadet Major Diego Gutierrez, a senior from Pine View High School. On May 4 chapter Vice Regent Valerie King had the distinct privilege of honoring AFJROTC Cadel Colonel Sayuri Catalan from Dixie High School. Both these individuals are fine examples of the graduates coming out of the high school ROTC program here in St George. Color Country Chapter is honored to support this organization and recognize their outstanding cadets in this way.